6 Amp Electric 8 IN. Pole Saw is rated 4.4 out of 5 by 45. Rated 5 out of 5 by Gustave_homme from Great little saw I didn't expect very much out of this product but I was plesently surprised. I've used it to cut birch, tamarack, popular, and pine limbs and it worked like a charm. Definitely worth the purchase. At full extension the anaemic chain still has enough bite to cut effortlessly. 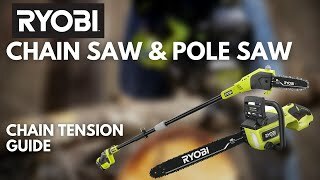 I can't compare this to any other pole saw as this was my first experience with them but definitely a good saw for the home gamer. The build quality looks to be good and as long as you take care of your tool this one should last a long time. Just wish I could get a spare chain at the local store. Rated 5 out of 5 by Aeroequestian from Gets the job done. My first cut took two passes, one from each side because it was from a 18 ft ladder reaching 7 feet topping the trunk of a seriously wind leaning pine tree. Like 60 degree lean 17 inch diameter trunk where I cut. I didn't want to climb with my chainsaw because it wasn't a fun one to climb and I wanted to cut it just enough that it didn't fall until that yank from my diesel. It sure worked. Later I used it for what it was designed for, pruning widow makers from my elms as well as some of those crazy limbs the tree is better off without. 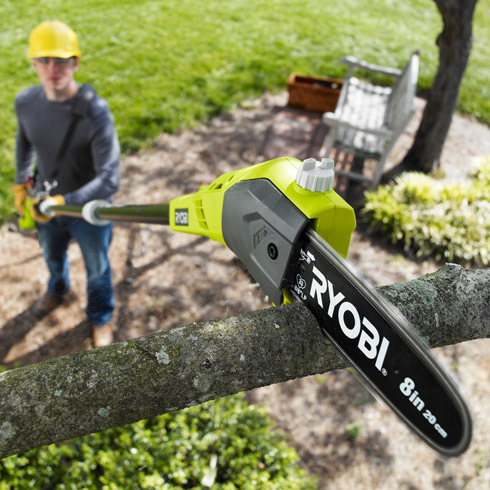 I've bought a few Ryobi tools now and if your a DIY homeowner type you get your best bang for the buck with them. Rated 2 out of 5 by Jobsundone from Great features for small cuts. Bad ch.... This is easy to handle and the adjustable length is great. Its a little heavier at higher heights, but has a strong motor. I like having it in addition to my ryobi collection. I was very dissapointed when I realized that my chain would pop off every 2-3 cuts. The chain mechanism is terrible. It's often hard to line up as it's become worn from the popping chain. I did troubleshoot and went through 3 $15 replacement chains. I believe the screw that tightens mine is loosening sporadically causing a loose chain that pops. My neighbor has given good reports, so I may have just gotten a bad one. I wish I'd have realized it earlier since I know from my Dad that tools should be around much longer than this one. I've resorted to my manual cutter for now and I'm waiting on improvements to the model. Rated 1 out of 5 by kbrian from How many times does the chain come off before I do Bought it 2 hours ago; chain came off on 4th cut out the box. Chain unseated 7, maybe 8, times. Carefully replaced each time. Adjusted tightening screw as directed. Two, maybe 3 cuts and I'm reseating chain. Piece of JUNK! Rated 2 out of 5 by Socorro from Needs improvements This saw is an inexpensive item and acts like one. There are two main problems. 1) The chain tensioning mechanism simply does not work. It's impossible to maintain chain tension during use. I'm not sure why, but either the tensioning screw tends to unwind or the pin that it moves doesn't stay in the hole on the bar. When setting up the saw for use, the pin barely enters the hole. Having a longer pin would perhaps solve the tensioning issue. 2) The sprocket retaining ring (external circlip) is too thin to secure it to its axle After losing two circlips which resulted in throwing the chain off the bar, I ended up using a very stout e-clip. The designers should have tried using this saw before putting it on the market. It would be nice to recommend this product, but with these flaws I can't. Rated 3 out of 5 by ATL DAD of 3 from Assembly issues with Pole Saw Santa bought me a Ryobi 6 amp elec. pole saw from Home Depot. It was the last 1(open box) on the shelf as I had to have it. However, it was partially assembled incorrectly as NOW I have read many reviews about the handles not lining up correctly if the small push in button is not lined up. Once the handle is assembled it will not come apart .... UNLESS tech support has a method to fix I guess I am stuck. 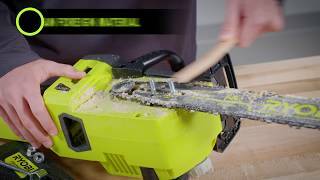 I owned a BUNCH of Ryobi products since 1995 but I am not to happy with this one. Rated 5 out of 5 by MrMike36 from Electric Ryobi Electric Extention Saw I bought this saw to reach tall tree limbs that I couldn't reach by hand. I have some tall trees around my house and the branches seem to hang out all over the place. This saw works great for the small limbs and the saw extends a little farther if need be. It's best to read the instruction book thoroughly and constantly check the oil level since the reservoir is limited in size. The recommended 25' cord legnth is a limitation but overall I am very happy with this saw. Rated 5 out of 5 by TLShandyman from awesome little pole saw this saw save me 2,000 dollars on a tree company bid to remove a 15 inch tree out of power lines, that the wind was blowing down, i didn't think it could handle the job, but it went way beyond my expectations! i don't recommend doing this kind of job yourself, if your not sure you can, this was first ryobi that had ever purchased, now i have a few more.